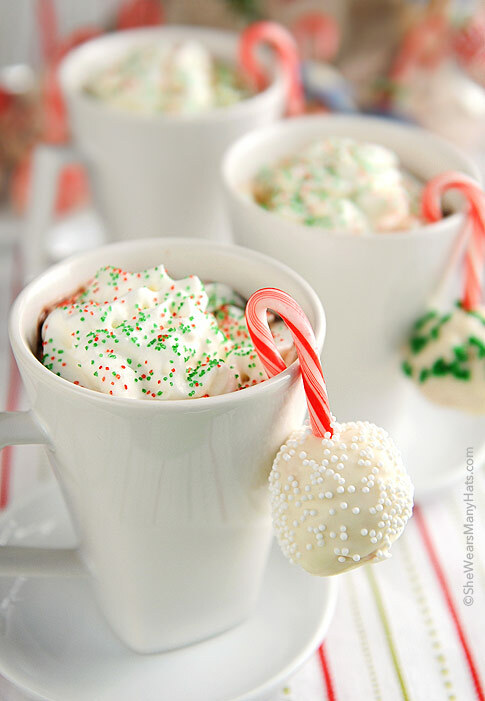 What better way to ring in the cold weather season than with a steaming cup of hot cocoa and a cute Peppermint Rice Krispies Treats Snowballs? There’s just something about that cool, sweet punch of peppermint on the tip of your tongue that makes the frosty temps of winter a bit more welcome. I was part of a team who made these for a Rice Krisipies® Treat challenge. Crushed up candy canes and white chocolate were added to the traditional treat recipe. A few sprinkles of holiday cheer, and a candy cane hanger completes the confection. This treat can be made one of two ways. You can either melt the white chocolate chips along with the peppermint into the marshmallow mixture for a quick and simple sweet bite or leave them out and use a melted chocolate coating to harness your holiday sprinkle creativity. You can also try using a fun shaped cookie cutter to inspire your own unique hanger shapes like this adorable snowman. These peppermint inspired treats can become a sweet addition to your winter holiday traditions! We sure had fun making them and sharing them with our kids. What better way to ring in the cold weather season than with a steaming cup of hot cocoa and a cute Peppermint Rice Krispies Snowball? Melt the butter in a large saucepan over medium low heat. Add in the marshmallows and allow them to melt completely. Add in the crushed candy canes. Remove the pan from the heat and stir in the Rice Krispies®. If making balls, pull out heaping tablespoons from the pan and roll into balls. Add a candy can into the center of each ball. If making cut out shapes, press the Rice Krispies® mixture into a pan prepared with cooking spray. Allow to cool for about five to ten minutes and then cut out your favorite shapes. Add a candy cane into the top end of the treat. Place your finished treats into the fridge for about 15 minutes to cool down. Melt the candy melts according to package directions and add in the vegetable oil to thin the mixture. Dip your cooled treats into the chocolate, sprinkle or decorate, and set aside to cool and harden completely. Note: For a quicker version, simply substitute one 12 oz. bag of white chocolate chips for the melts and oil. Add the chips in with the marshmallows and heat until completely melted. Proceed with adding the candy canes and Rice Krispies®. You can then roll your balls and add sprinkles to the still warm treat. Disclosure: This post was sponsored by Rice Krispies® and The Motherhood. As always, all opinions are my own. I love the holidays and baking! Cute treats. So so so festive! Love it! I’m definitely all about comfort food in November and December… my favorite thing to make are spiked cups of peppermint hot chocolate. Beautiful treats! Our whole family looks forward to our little family decorating party during the holidays where we have snacks, sweet treats and wassail! These are pretty! Our traditions at Christmas involve lots of food, attending church, and family time! And hopefully time to walk off the extra calories. These are ADORABLE!!! I even love the red and green sprinkles on the cocoa Amy!! those look yummy! I love the handprints I make/made of my children every year. and the baking of course. amy these are adorable! i’m making them for my entire office 🙂 and you just single-handedly got me stoked for Christmas! Wonderful idea to do with the kids. I’m looking forward to trying. Every year I make cinnamon cookie decorations with my children, some we keep and hang on the tree while others we package up and give as gifts. Those are so adorable! We bake cut out sugar cookies every year on the first day of Christmas vacation. For me, the best part of the holidays is baking with my 4-yr-old and 7-yr-old helpers! As far as holiday traditions….we are all about decorating the tree. My Uncle-in-Law (is that a thing?) owns a tree farm, and we take the kids there, pick out a Christmas tree, and then we decorate it at home while we listen to Christmas music and drink hot chocolate. I love it and look forward to it every year!! EXACTLY what I needed to make treats for the faculty at 2 AWESOME schools!!! THANK YOU — EVER SO MUCH!!! Happy Holidays!!!! It’s fun seeing my holiday baking favorites (like peppermint chocolate chips, etc) show up in the grocery stores. Although I’m still looking forward to Thanksgiving FIRST. 🙂 My kids are anxious to dip candy canes in their hot chocolate. I love “playing” with Rice Krispies! Just saw someone post about some new Candy Cane/Peppermint Marshmallows. Gotta find those. We always make gingerbread houses on Christmas Eve as one tradition. There’s no better time for baking than Christmas. Our must have was always cut out sugar cookies! Love these. One of my fave traditions is a new one. I love riding to polar express with my kids. That’s christmas to me! My favorite holiday tradition is really just setting up the Christmas tree. We do it the day after Thanksgiving every year, and I love looking back over the years at how things have changed. From the ornaments my kids made in preschool, to the new one they picked out from that year, to the cup of hot cocoa we enjoy with the lights dimmed once we’re finished. These little snowball treats might just be the perfect addition! One of my favorite holiday traditions in years past was driving into NYC and going to see the Christmas tree at Rockefeller Center. Those are adorable! We love making homemade ornaments. I’m not sure how long those would last on our tree though! Our tradition is decorating the xmas tree together while going down memory lane. Amy, those are darling! The candy cane hanger just sends it over the top for cuteness-cleverness-adorableness! My favorite Christmas tradition (besides decorating the tree) would have to be an evening spent looking at Christmas lights with the whole family as Christmas music fills the car. We like to start the evening with dinner at a favorite neighborhood pub, (fried pickles are always part of the package), and then drive off into the evening with our bellies full & our imaginations hungry for the spectacle of lights that are to come! These are so cute! I look forward to this after I was inspired by your fruit kabobs last year! My favorite tradition is the “bake-off” every generation of women in my family get together one weekend in early December and get all of our Holiday baking done together. What a wonderfully creative idea — I love Christmas treats! Super cute – my kids would love these! Our favorite holiday tradition is enjoying homemade hot chocolate with Christmas music. The kids could do this every night and never get tired of it. We also love reading Christmas picture books. My best Christmas memory was when my children were younger at home. I always had a Chstimas tree and decorations, and made some of their favorite treats called “empanadas” which is a tradition from my homeland. Adorable! My kids will love these. I may make them for the 1st grade Christmas party, super cute! I love your Rice Krispies snowballs! How clever! We always gather for Christmas Eve in our family and the past so many years, it’s been my house…we have a wonderful dinner together and watch the kids open presents. The food and togetherness are my favorite part! How cute! I love peppermint and chocolate, but I think I might try these with dark chocolate. I have been craving these for months! Now I finally have the perfect recipe to make for the holidays. Thanks! Oh these are so wonderful and festive. I would also like to try them with Coco Krispies. My daughter would love to make these!! Peppermint rice krispie treats?!? Those sound so good! Really cute treats, they look great! I love to make tamales one time a year and that is Christmas time. Tamales for Christmas eve are a South Texas tradition, borrowed from our neighbors to the south. SO adorable! I love the snowman ornament idea! It’s official! Reading this has just thrust me into thee Christmas spirit! We always have to have a REAL tree every year. These are so adorable!! The cocoa with sprinkles is also right up my alley!! What fun holiday treats!! I love baking and making special goodies for the holidays. Those are so adorable! Love the festive theme and mood you captured! cute treats! i love decorating for christmas the weekend after thanksgiving. baking, christmas music and decor… just love it! My favorite tradition is the “Family Gathering” All of the family getting together to just enjoy the time together. And all the food is a plus! These totally make me wish I was creative! What a fun idea I can do with my girls! Thanks Amy! My daughter will be home from grad school and we will make her favorite gingerbread cookies together. We have also had a special photo ornament with her photo made for the christmas tree each year. We will add her 24th photo ornament for this year. It is always a joy to unwrap these ornaments and talk about why we bought that particular ornament that year whether it was a soccer photo ornament or a photo ornament for her 1st day of school. My favorite holiday tradition is watching the Little House on the Prairie Christmas episode where they get snowed in and reminisce about past holidays. Makes me cry and I’ve seen it probably 50 times already. Is it too early to watch it this weekend? Hi! My favorite tradition is decorating a gingerbread house with my nephews! My favorite tradition has got to be fresh cinnamon rolls on Christmas morning. Thanks for the chance to win! Pick me!! One of my favorite holiday traditions is “the cookie tray”. My mom has been doing “the tray” for as long as I can remember. It’s simply a tray of favorite holiday cookies and each member of the family makes their favorite cookie known, and just like magic, that favorite cookie can be found on the cookie tray. My favorite cookie for the past 30+ years has been chocolate crinkles – YUMMY! Cute, cute, cute! And looks delicious! I am so excited for Holiday Baking!! My sister, niece and I love to get together in the kitchen and make holiday themed treats. I can’t wait to try these! I love rice krispi treats- these make them so fancy! My family always does one epic day of cookie baking during the holiday season–most of them are for Santa, but the other batches head to our extended family’s houses for Christmas parties, to friends’ tables, and sometimes to hungry neighbors! I love this idea!! And now I can say that I am excited and ready for Christmas after seeing these extremely cute and festive treats! Every year on the 23rd of Dec. the entire family (aunts, uncles, cousins, close family friends, sisters, brothers, nephews, nieces, etc) go to my mothers house. We have appetizers, spend time with each other and all of the children receive gifts. We used to have this on the 24th but moved it to the 23rd 15 years ago. In all my years, it has only been at someone else’s house one time…the house was bigger but it didn’t feel right and we went right back to Mom’s house the next year. Everything looks delicious! Every year we bake all different kinds of cookies and give them out to families and friends! These are so cute. Would love to win. Thanks for the chance. When I was in college, I started the tradition of picking one day, getting up “early” (7am) and baking all day long for my family – or as long as I could physically last. I would end up exhausted, but pleased with the supply of cookies and candies I had created. I have continued this for years – although I’m not sure how I’ll manage this year with an almost-toddler. These are so adorable. Could not be more perfect for the holidays! My favorite holiday tradition is that every year the weekend after Thanksgiving we take the last drive into the mountains here in Idaho. Much later than that and there is to much snow so you can’t go. My family and I hike around with our dogs and find the perfect (in our eyes) Chrstmas tree to bring home a decorate. I love to bake cute things just like this with my kids – it’s our annual holiday tradition! These are so adorable. Love them! So Cute!! can not wait to make these treats with my grandkids!! My kids love Rice Krispie treats. Me, not so much. But I am a fan of peppermint so I am definitely going to give these a try! One of our favorite holiday traditions is the get together dinner. These are absolutely brilliant! What a fun idea for a kids’ holiday party. As for our favorite traditions, I’d have to say making my husband’s great-grandmother’s spritz cookies with sprinkles. The whole family gets involved! 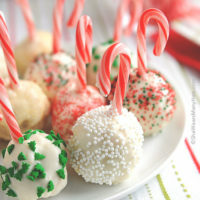 Great idea to put the Rice Krispies balls on candy cane, love it!!! yum! my dad makes toffee, peanut brittle and fudge every year for Christmas!! These are adorable! My granddaughter and I will enjoy making these for the holidays. So cute! One of our holiday traditions is decorating a gingerbread house together. We have a really fun tradition of making a gingerbread house every year. It’s always one of those premade kits but my sons love it! a family tradition would be going to visit both sides of my boyfriend’s family and mingle and whatnot, a wonderful experience. That looks sooo festive and delicious! this might be the only time i wish i had children in the house right now because i’d totally be making these!! Our favorite traditions are to decorate our real tree with collected ornaments & baking cookies and drinking hot cocoa. My favorite holiday tradition is eggnog! I can’t get enough of it! And it has to be the full calorie version… non of that low fat low fun stuff. 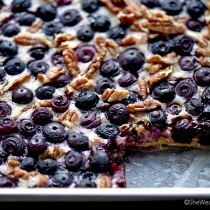 I will try making some of these rice krispi treats this years! Krispies are my favorite! looks yummy! I think we have a new treat for school parties this year! I’m so excited to try these. My kids are going to love them. Our holiday tradition comes from my dad. Each year he carefully opens walnuts, takes the nut out, puts something small inside example (money, candy, once he gave my mom a diamond ring) then he glues them shut, and if you did not know about the tradition, you might never open the walnut. However, in our family they are always the first gift opened! those are so cute!! can’t wait to try em… drinking hot cocoa and driving around looking at Christmas lights is my favorite holiday tradition. I can’t wait to try this! I’m putting together a bunch of “fancy” hot chocolate kits for Christmas gifts, and I think these will go along perfectly! Yummy treats! I look forward to trying these at home with the hubby – an avid lover of rice krispy treats! I LOOOOVVE watching those cheesy claymation Christmas movies (Rudolph, Jack Frost, ALL of them! ), preferably on VHS like the old days (DVD is cheating). I also love my Grandma’s amazing cherry pie…all of her cooking has gone south, except for this pie!! And my Mom always gives my brother and I a big tin of thin, traditional gingersnaps. Since I moved away I love getting them in the mail even more! Very cute! We always have hot chocolate after midnight mass. 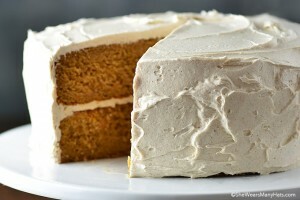 This looks like a yummy treat to enjoy with the hot chocolate! Thanks for hosting the giveaway. My nephews birthday is Christmas day, so we always have birthday cake later in the day! These look like fun treats for his party! How pretty those are!! One of our family traditions is camping at the Rose Parade! Sooo much fun! It’s become a tradition for me personally to make holiday treats! 🙂 I love Christmas, the holiday season in general, and BAKING! I can’t wait to try these! They are so cute and look delicious! Thanks for the recipe and ideas! I absolutely love your creations…to me, they just scream “holiday fun”! They are so cheerful, and I am definitely going to have to make them! Thank you for the generous giveaway! How super cute! They are perfect hanging off the cups of cocoa. My favorite thing to make around the holidays is peppermint bark, it’s become somewhat of a tradition. Wow, those look delicious! I love peppermint!! I’m always looking for things for the kids to help make….these are PERFECT! I love to put the kids (every year it’s a different kid, a niece, a nephew, and now grandkids! on the chair next to me and see the pure joy on their faces when they dip their hands in the messy goo of cookie dough or melted chocolate or whatever it is we’re making! Good morning and thank you for the chance to win. I love making holiday cookies – especially recipes that are pulled out from the deep reaches of our family traditions. We make cream wafer cookies only at this time each year – always a treat to look forward to! Love this idea. One of my favorite Christmas traditions is taking a Friday off from work and baking my holiday cookies and cupcakes all weekend long, then packaging them up and delivering them to my friends and family. Oh my, totally bookmarking this. My 4-year old would LOVE these (and quite frankly, I would, too!). We always decorate our tree the day after Thanksgiving–steaming mugs of hot cocoa along with these cute treats might just become a new part of our tradition. Thanks for sharing this! The Krispie Treats are just Adorable. Thank U 4 this opportunity on this great giveway. Tradition in our family is that we Always make a German cookie called Peppernuts and then of course we always have to make the cuger cut-out cookies. We celebrate the birth of our Lord with a birthday cake. These are adorable! I have a great recipe for white hot chocolate that you make in the Crockpot- these will go with that perfectly. Thanks for sharing! Ever since the grand girls were three and five our tradition has been to make pumpkin pies the day before Thanksgiving. Standing on stools, they each make their own pies, measuring and stirring, cracking the eggs and pouring. They are always so proud taking them home to their parents. I hope they will always remember the times they made their pies with grandma. They are too cute! I have to make them for my christmas party this year! I love baking christmas cookies with my little girl. We have so much fun and make an absolute mess in the kitchen. We love to clean up while earing our christmas treats. I love making new holiday treats and ornaments for the family … I don’t get to do this as much anymore but these sound delicious!!! These are so amazing and simple, I love your idea! My favorite holiday tradition is to have candle-lit dinner at home on Christmas Eve and New Year’s Eve. Kids love the ambiance of eating by candle light, and so do I! These are amazingly festive, I love the colors and the creativity! Not only do these sound tasty and wonderful but they look so cute hooked onto the side of a mug of cocoa (or a nice latte)! I’m adding this to my list of “Treats to try this year” Thanks! One of our favorite Christmas traditions is that our immediate family has Christmas on the 23rd because Christmas Eve & Christmas are so busy going from one family gathering to the next. We decided to have our own family time on the 23rd when there’s nothing else going on. We have a big pot of chicken & dumplings & open presents & then have a warm cup of cider or hot chocolate & just hang out together, just the 4 of us! LOVE this time! I so look forward to your Rice Krispie creations each month and these are the best! I was looking for a mini apple pie recipe yesterday and, lucky me, your site came up! I can’t wait to try your mini apple pies this weekend for our Thanksgiving Dinner. My family LOVES apple pie! I am going to enjoy my daily visits to your site. I am a high school guidance counselor but my joy are my two grandchildren. We are going to have fun with this recipe. The holidays are special family time for us! Thanks for sharing your creative fun with us! Those are so cute and tasty looking. I just like to be able to see my family during Christmastime! For Christmas, I love eating all the different food the family makes…espcially the desserts! 🙂 Yummy! These are so cute!! I’ll definitely be making these at least once this year. My favorite holiday tradition is listening to Christmas songs while decorating the tree. I want to try to make some of these treats for my upcoming Christmas party. The food looks delicious, but what really impressed me was the use of Christmas colors in a slightly softer hue that we usually see. They are clearly Christmas, but they are so bright and fresh! 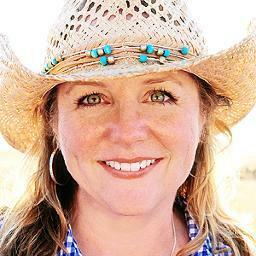 I saw this over on Somer’s blog and had to hop over and check out your post. These treats really are phenomenal and i can’t wait to try them with my kids, because I know they will love them. As for a holiday tradition we love to go cut a fresh Christmas tree down with the kids and then have hot chocolate and cookies. I am hoping it is something they will think back on with fondness when they are older (currently only 9, 4, and 2). Enjoying hot cider on a cold evening. Thanks for the opportunity to win! Willing to go off my diet for these! I love these Peppermint Krispie Treats. I love the celebration of Christs Birth. Your photos are beautiful. I definitely will be trying this recipe. Seeing these made me so excited for the holidays! Can’t wait to try them out! My favorite holiday tradition starts on December 1st. We bake a dozen treats everyday until the 25th and find someone who needs a little kindness to give them to. I want to teach my kids that giving feels really good. I find it interesting that they can’t remember all the stuff they got each year for Christmas but they remember every detail of the reaction they got after giving away treats they made. Ah, the magic of the holidays! We love opening presents on Christmas Eve! And wine with every holiday meal! We always have seasonal flowers on the dinner table for holiday meals to create the perfect atmosphere. I am so excited for the holidays this year! My boys would love these! Thank you for the giveaway. I make the best peanut butter cookies in the land so my family and friends say. So every Christmas I have to make about 50 dozen cookies. But one year someone ask me if I would sell them some, so I did and that year I made a total of 120 dozed cookies because word spread that I was selling them. Happy Holidays To You and yours. Our favorite holiday tradition is enjoying all the wonderful decorations, lights, and music. Wow! My kids would be crazy over these. Every year we decorate cookies for the holidays. I might have to add these to the list too! christmas is my favourite holiday! we have a party but there isnt really “tradition”. I am so excited about these! My daughter is on the HS Drill Team and every year they have a caft fair/bake sale for a fundraiser. I am going to make these for the bake sale! I know they will be a hit! Thank you so much!!! What a great giveaway! Those are adorable. These look delicious! I will definitely try them 🙂 Thanks so much for the giveaway! Every year I make salted caramels for everyone. This year so many people have asked for them that I have to make more than ever. haha I like to call the upcoming event “Caramel Craziness”. we love sledding on golfcourse! These look SO yummy! Thanks for the chance to win! These are really cute! Can’t wait to have them at my cookie swap! Thank you for sharing . I LOVE your recipe idea!! My 12 year old Daughter was diagnosed with Celiac three years ago this week and we are always looking for recipes that we can tweak to make gluten free that EVERYONE can enjoy without it being “weird” food. Now that there is a gluten free Rice Krispies we can make these beautiful treats for our Christmas Eve Party and EVERYONE will be thrilled – especially Gracie since she won’t have to eat something different from everyone else. what a great idea! I can’t wait to make these with my kidos. Very sweet looking treat. I can’t wait to try them. Cute idea for holiday treats. Building a gingerbread house the week before Christmas has been a holiday tradition with my daughter. She loves decorating it and by the end of the break the candy decorations are mysteriously gone. I love this idea! A tradition I have is I do a hot chocolate bar when my family comes over for Christmas Eve dinner. I have small containers of marshmallow, piroulette’s, candy canes and other fun treats to add to your hot chocolate. This would be a perfect treat to go with them this year! I just stumbled onto your page from foodgawker. These look adorable! Will definitely try them out on my friends this holiday season 🙂 My favorite holiday tradition is listening to the Gloria Estefan Christmas album! Love the treats – how creative! My favorite traditions include baking and spending time with my family! Wow these are so amazing!! 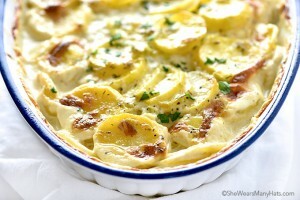 Delicious, party favorite, and not too hard to make! Thank you! These are SO cute! My kids are older now, but my co-workers would love them! What a fun idea for an office gift exchange! Thank you!! I love making sweet treats and sharing them with friends and family. This year’s main treat is Ice Cream Bread. I’m looking forward to making these for my office holiday cookie exchange! Super cute! These are darling! Can’t wait to try them. One of my favorite Christmas traditions is watching Love Actually with my sweetie. We love baking during holiday seasons. These definitely look like something I could make with my 2-year-old! Thanks for sharing. As for holiday traditions? I’m looking forward to making some with my daughter as this is the first year she’s REALLY into Christmas. Putting up the Christmas tree was THE BEST it’s ever been and I nearly cried at how sweet and excited she was! What a blessing she is in our lives! These look so cute! We have a tradition of giving the kids one present to open on Christmas Eve. Love this idea and it is so great to do with little ones. Christmas when I was little was about getting the tree from our back property and bringing it home to then have cookies and hot chocolate while we decorated the tree. This would bring back those memories for me and make new ones with my 2 year old daughter! I love the idea of adding the candy cane for hanging! Our traditions involve a lot of baking, and drives to see the best Christmas lights. My favorite tradition is on Christmas morning my girls empty their stockings while I prepare breakfast which is always fruit salad and monkey bread with a birthday candle in it for Jesus’ birthday. These are so cute!! I may have to make them very soon. One of our family traditions is to make old family recipes (German cookies) in all varieties and give them out to our friends. Love it. These are so cute! I definitely will be making these. These are adorable! I can’t wait to make little hot cocoa treat bags for the kids and include these! One of our traditions is my sisters and I getting together right before Christmas to have a cookie baking day! Rice Krispies Treats were my daughter’s first kitchen creation – great memories. Happy Holidays! One of my favorite holiday traditions is making and baking treats throughout the season and then spending Christmas Eve watching Christmas movies, and of course enjoying some of those treats along with a cups of cocoa, spiced cider, and homemade eggnog. Thanks for this recipe; can’t wait to try it. PS – I hope I win that Visa card! What a cute idea! I may do this with cake pops. We always put our Christmas tree up every year the weekend following Thanksgiving while the whole family is still in town and these would be a great treat for that day! My grandmother and I used to make peanut butter balls every Christmas. Loved them. I love making peanut butter balls and Sharkel for Christmas! Thank you for the opportunity! Wonderfully sweet little treats. They are so cute. We meet for Christmas Eve and enjoy a night out at Olive Garden then back to my aunts home for all wide spread of treats shes worked days to prepare…wonderful times! My mother and I always buy some expensive mixed box of chocolates that we’d never buy any other time of year and then we slowly eat and grade the different bits on Christmas Eve. We always go to the holiday lights at a local park here. We make it a special evening by going out for dinner first then driving through! Yum! These sound absolutely delicious and are just too cute! Loves it! 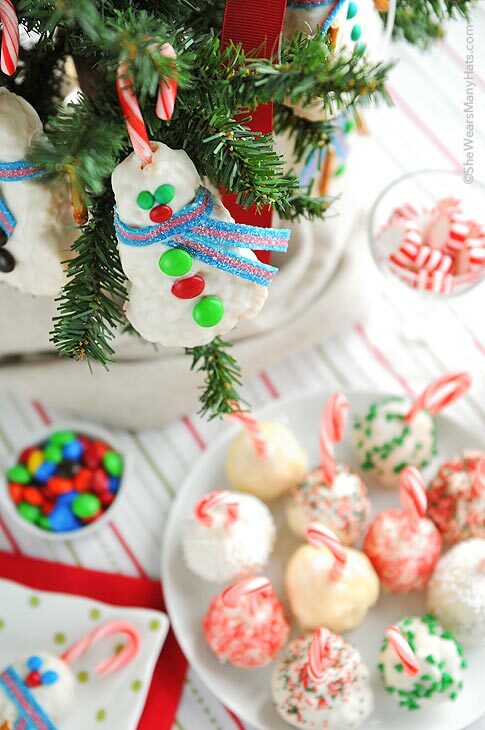 What a great idea, especially using the candy canes to hang the treats on a mug or on a tree. Those are gorgeous! I love the idea of dipping them in candy melts! I love these, especially the hanging-ness of them. I’m going to have to try that with other cookies! Delightful! We love making ginger crinkle cookies every year at this time; they remind me of my childhood, and are so yummy to boot! 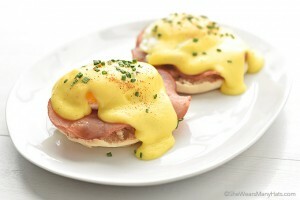 My favourite tradition is definitely our Christmas morning brunch with french toast, slow cooker ham and fresh muffins. It’s such a great family meal and slows down the day. These would be great with Nutella hot chocolate. These are so cute! 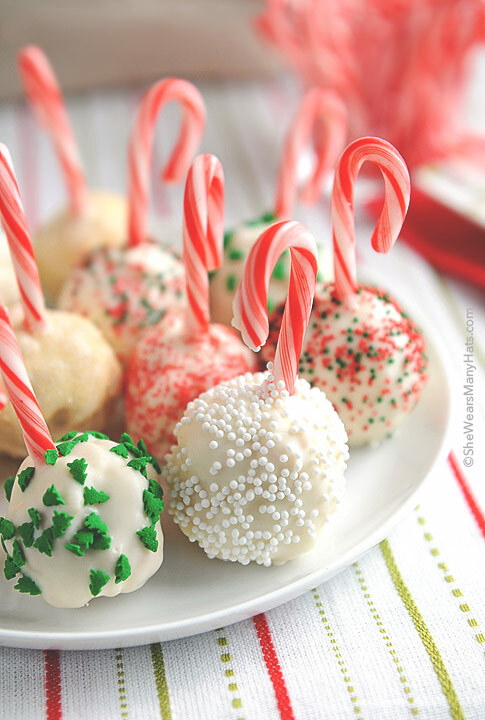 They look like cake balls – I gues you could use a candy cane instead of a stick for those. I’m going to try this with the new peppermint marshmallows I just bought. I was also thinking of adding some mini chocolate chips for some chocolate action. Can’t wait to check your site out further! THANKS! These look delicious. They look like cake pops everyone is raving over, but GF and way easier to make! love it!! My favorite holiday tradition ~ Christmas morning breakfast with my family. Chocolate krinkle cookies are always a holiday treat. But I’d like to try these… and this year, I’m making my own marshmellows, too. Every year we spend the entire day (Christmas) in our PJ’s! No formal wear for us, it’s all fun! For Christmas we always wake up early to see what Santa Claus has left under the tree. Then we all don our elf hats and head over to IHOP for breakfast. Afterwards we come back home and open our presents. Love these! So cute, will have to try them! Thanks for the giveaway! These are adorable and look extremely tasty! I would be careful about hanging them on the tree though if you have pets! Our Holiday tradition is my 8 year old daughter and I spending the weekend before baking all kinds of treats. She leaves a note out for Santa on Christmas Eve, with different treats out on a plate that we had made. I get the girls up on Christmas morning to see what Santa brought for them and watch the smiles and joy on their faces. BELIEVE! What a great idea! 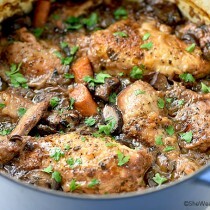 I love the pictures I am drooling already and heading out to the store to try to make some with my Egglets! These could not be any cuter Amy! May have to make them a part of my favorite holiday tradition – cookie baking. These look so festive and sound delicious! baking with the kids, i’m a cake decorating instructor so it’s in there genes to love it! One of my favorite Holiday traditions is getting together with my Grandma and Aunts to bake cookies. Then we divy them up between each other. YUM!! I bake the cookies for christmas at our house. My favorite has always been the decorated sugar cookies. Everyone gets help and thkids loved the frosting and sprinkles. This year my grandson joined in on our decorating and it is so fun to have a little one involved again. So very cute! Thanks for the ideas and the giveaway! These are super cute. I love rice crispy treats, but they’re usually so unimaginative, these are both creative and festive. I can only say Y-U-M. Thanks for the giveaway! We make caramel corn and Hot chocolate to take along in the car to go look at Christmas lights…my kids look forward to this the whole year! My favorite tradition is leaving one gift unwrapped on the fireplace hearth so the kids see it when they see their stockings. It’s enough to keep them from hounding us to open the gifts until everyone else is awake! I can’t wait to try this recipe. It looks so yummy. One of my favorite holiday traditions is making treats for my family. While I enjoy making treats with the kids, I think I like the Christmas Eve dinner tradition best. We eat Cuban pork roast, black beans and rice. This year we started doing Advent activities and I’m loving that and think we’ll enjoy this for years to come. I made a calendar and put in daily activities that includes fun stuff and treats so we have a month of Christmas fun. I came across your blog from NotMartha.org and I’ve never gone wrong with Megan’s suggestions. Will definitely add your rice krispie snowballs to our activities this season. Thank you for sharing! These are wonderful! My favorite holiday tradition is that when we open presents, we all take turns and then oh and ah over what everyone gets! Thanks for the great recipe and the chance at winning! A wonderful tradition through the years is doing home made gifts and gift cards giveaway. I am the youngest of seven and it’s tough to buy for everyone. So I buy and make things within a certain amount of money and buy gift cards and make things as I love to do that. Not only is it fun, but I also save a lot of money. My family loves this. It’s like winning a prize. I have given gifts through Spanish Bingo, Christmas trivia, and even drawing numbers. It’s lots of fun and less stress for me and they get to enjoy “a fun thing to do” at Christmas! We have a tradition in our house of each year wrapping each persons gifts in their own different pattern and color of wrapping paper. It began years ago when our then preschool children could not read gift tags, and it was a way for them to find their gifts under the tree. Sixteen years and four kids later we are still doing it. It is fun to race to the tree on Christmas morning and find the “color key” that has each person’s name (or a picture of them for those who can’t read) and a little scrap of “their” paper next to it. I have even begun saving these for my scrapbook. A tip: make sure each person’s special paper is really distinct from the others. My oldest unwrapped my only gift last year because my paper was really similar to his. It was not a big deal for me, but he felt so bad. We have a stash of “other” paper we use to wrap friends’ and relatives’ gifts, and those get tags. So cute! We love to set up the Polar Express model train under the tree, turn down the lights in the room and read the Polar Express book before bed. One of my favorite holiday traditions is definitely taking a walk around the neighborhood with my mom after Thanksgiving dinner and Christmas dinner. It is always a time of reflection and ease. Not to mention how good it feels to walk off some excess eating (especially before pie). we love making gingerbread bird cookies! Looks so good! Can’t wait to try them! my new favorite holiday tradition is Elf on the shelf!! I love the snowballs!! adorable!! These look amazing…thanks for sharing!! I’m going to make these for Christmas this year. yum! Headed to the kitchen- hoping they turn out as adorable as these did! I treasure decorating the tree and remembering all of the kids’ school projects that encompass the majority of our tree. This is a simply wonderful idea….. love it! Thank you for sharing. My most favorite holiday tradition is when we go out to the Christmas tree farm to fetch our tree. We go pick it out and cut it down. The farm has a fire pit for roasting marshmallows. When we get home we turn on the Christmas music and drink hot cider out of our Christmas mugs and decorate the house. It’s one of my most favorite days of the year! Love holiday baking..and new ideas! Christmas Eve Jammie’s are my fav tradition! that circlae the block and come back, if they stop he will go out to the car and talk to the children and give them a candy cane. He reminds them to go to bed early so that he can get started on his journey with the reindeer. We have just as much fun as he does watching through the window. Merry Christmas! Those look so good! I am definitely making them for Christmas. So cute. Definitely going to try these this holiday! Yum! My boys will love making and eating these. Thanks for the recipe. Our family tradition is to take a car car ride to all the neighborhoods with lights and marvel over them while sipping hot cocoa. I love this idea and am going to make it with my daughter that is 4yrs old this weekend. We normally make cookies but this is really simple and fun also. I bought the ingredients tonight to make these peppermint rice crispies because one of our fave traditions is baking together. My daughter will come home next week for 8 days and we have lots of baking plans. Say do you know what snowmen eat at a dessert buffet? Ice Crispies! What a cute idea! One of our favorite traditions is my kid’s involvement in the church choir program. I am going to try these with my preschool class next week! looks fun! these are so cute! they would be perfect at my annual christmas ornament party! Having been diagnosed with a gluten intolerance this year.. rice krispy treats are one of my new favorite snacks… thanks for sharing this recipe!! Such a cute treat! Kids and grown-ups would love these! 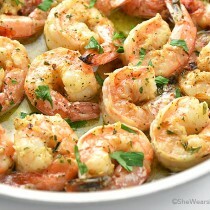 Might make them tonight! we made these and had a blast! Love it! I am totally going to make these! Thanks for sharing these! I found you via Pinterest and have included your recipe on my top 10 list for pinterest christmas recipes.